I want a fire truck cake. Okay, maybe not a doghouse. A white chocolate bone! Why would half of it need to be made of hamburger? Why not all of it? Hamburger cake. This needs to be a real thing! That smile! It burns my sooooul! well Epic Meal Time made a meat cake a couple weeks ago. 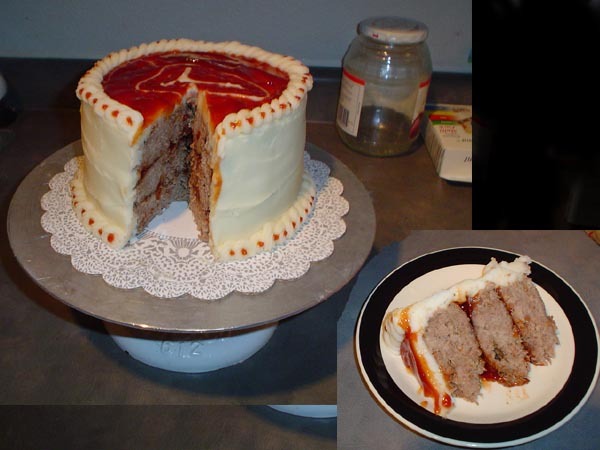 Hamburger Cake is actually not very uncommon at all. CALL THEM RIGHT KNOW AND HIRE THEM !!! Maybe a sugar free cake, no chocolate, the designs of dogs on the cake, Hambuger flavor, Vanilla icing, Milkbone flavor in the center, and a biscuit on the top. What you think? Cake half made of hamburger. Not sure if grossed out or really intrigued. I want a post-modern design with some details of the Renaissance era, also if you could give it some gothic-ish style with glimpses of romanticism ... is that ok ? However, I am curious as to what the cake design will be. Duff Goldman could probably make it work, though. What's with King's mole in the last panel? That is, like, 4 pixels of discolouration. How did you pick that up? I can imagine a giant dog-bone shaped cake, and now I'm hungry! Hmm...a hamburger sounds weird but awesome. xD I would think more along the lines of a root beer cake. But I'm curious what the designs on the cake will be in the end. So what if dogs are allergic to chocolate? Alcohol and narcotics are damaging for human health and brain sinapses and fast food in general has high levels of blood pressure raising cholesterol, but that didn't stop us did it? DID IT?! A realitty show/paparazzi worker wittan anima? Signore cartúno, Imma afraid you are expirienzing demennzzia! Last edited by Silly Zealot on Wed May 01, 2013 10:48 am, edited 1 time in total. I agree, they should make it a completely hamburger cake. In the human world, they call that meat loaf. Also, was I the only one who saw 'puppy' and 'in the oven' in the title and thought something ccompletely different? I don't think Rick would write that one in this early though. He looks so happy with his job! I wonder if he dances as he bakes? It doesn't take much chocolate to make a canine violently ill. I can't imagine the honeymoon would be all that enjoyable while being sick as a dog... erm, so to speak. Oh, and it has to include Stonehenge and the Tardis. For some reason I'm starting to find this arc disgusting. Oh well. I'm sure it will pass. Lol, I dunno x3 Good eyes? I demand that he be tagged "Antonio the Crazy Cake-Man"
It's not an allergy. Dogs actually lack several enzymes in their liver which allow other species such as humans to break down the chemical compunds in chocolate. This means that the breakdown of these compounds in dogs gets stuck halfway and the dogs end up with an accumulation of toxic byproducts that they can't get rid of which causes liver damage. If the damage is severe enough, it will cause liver failure and ultimately death. Yeah, I'm studying to be a veterinarian. I suppose the difference is that at least we can metabolise the alcohol, narcotics and cholesterol, whereas the dogs can't do anything to get rid of the chocolate toxicity. As for why we do that to ourselves, what can I say? Humans are idiots. "And the cake shall have a bone theme. What do you mean it sounds like a funeral? It's a dog wedding cake, you buffoon!" When i think of a hamburger cake, I now think of Hamburgler. When i see that baker, I miss Maxwell's smile. I catch thos discolouration in this comic every time and they drive completelly me crazy. EVERY. SINGLE. TIME! I'm overrreactive about spots in general like that. Yup, you have explained many times about your desire to be a veterinarian. Be avised, though, that, even when you most likely know this far better than me by now, very few of the animals that are sent to the veterinarians (better-inarians?) are hardly cute-looking. My mom told me of the time when she and her family fed chocolate to two pet dogs she had when she was a child and they grew boils all over their skin for a while. Well, after my attempt to eat Hansel and Gretel backfired (pun[s] not intended, my sweeties. ), I had to find an alternative that didn't fight back so much and wasn´t so legally compromising for me, my pretties! very few of the animals that are sent to the veterinarians (better-inarians?) are hardly cute-looking. Don't I know it! I've seen animals which are angry/frightened/upset and trying to fight me, boils, abscesses, pus, scabs/scars, gangrene... other things I won't even mention here. We've also been learning how to handle angry or upset clients. It's lots of fun trying to work out what to say/do with a guy yelling in your face or bawling his eyes out in front of you. I'm well aware of the nastier side of the job, but thanks for the advice all the same. Despite the hardships, it's seeing the animals recover and flourish under your care, or knowing that you've done absolutely everything possible to help the animal even if it hasn't worked that makes the job worthwhile. We vets don't do what we do for the money or the glory. We know it's a messy, tiring, difficult job often with long hours and low pay. But we do what we do because we know that we can make a difference and that there's nothing more rewarding than helping in any way you can those who are unable to help themselves. Anyways, that turned out longer than I expected. I didn't mean it to sound stuck up at all either. Sorry about that. Back on topic (ish), I've never noticed those "beauty spots" before. Have there been many others?